The Draycott is an exercise on bespoke design and all of the furniture in the restaurant has been meticulously custom designed by Fettle. 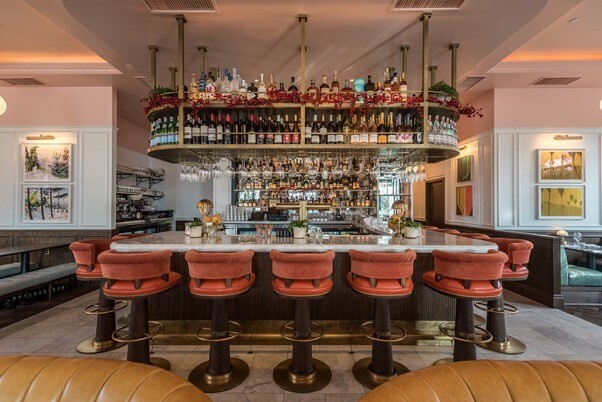 Signature Fettle designs include a marble-topped jewel-box like bar in the heart the space with other elements of the dining room symmetrically positioned to create a strong sense of uniformity and organisation. The bespoke dining chair used throughout the space is a stand out piece in the restaurant and takes inspiration from a traditional brasserie chair but is upholstered in a rich tan leather with an added arm pad, studwork, timber leg and arm details. 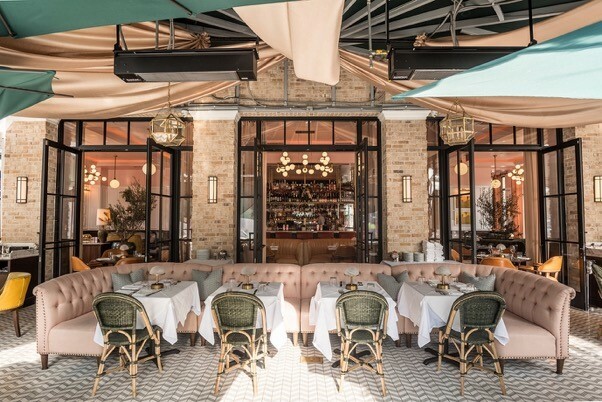 Other design features include the ornate ceiling, the bespoke marble mosaic floor on the outdoor terrace and the dramatic patinated brass back bar. 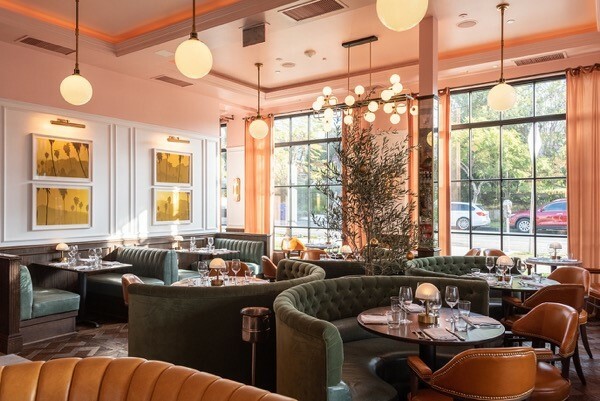 Fettle used a fresh yet bold colour palette to create a Californian ambience throughout the space including a coral-coloured coffered pink ceiling with detailed cornice-work that sits alongside striking leather upholstery in mustard and rich green. Fettle has married different textures together and in several areas of the restaurant used tone on tone finishes with the same piece of furniture. For example, the bar stool seat is upholstered in leather and the back pad in mohair in similar colours to add a sense of playfulness and depth to the design. The simple white walls of the Draycott form a canvas for the mixture of local and European art on display. 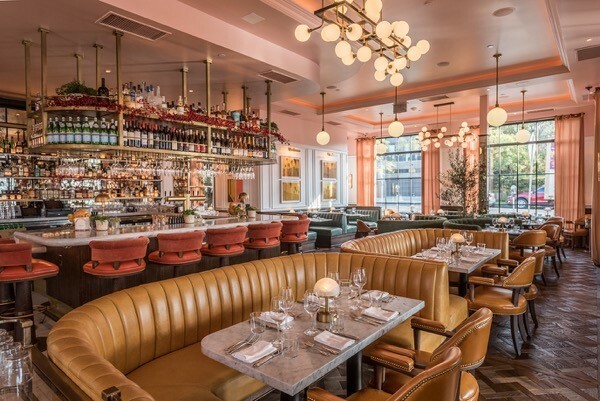 The restaurant is lit using diffused lighting and includes statement frosted globe pendants with antique brass and blackened steel fixtures. Fettle also sourced decorative floor and table lamps from flea markets and vintage shops across Los Angeles, which gives the restaurant a lived-in feel. The elegant and expansive terrace overlooks Palisades Village Park and is covered in a vast canopy to allow for year-round outdoor dining. Fettle oriented the Riviera café style seating to look out over the terrace from the interior. Within the restaurant, every seat has a great view, either of the impressive bar, terrace or the park beyond.